Q:I work for University of Michigan, what kind of dental coverage do I have? A:You need to enroll yourself in one of the three plans offered by UM. Option 1 costs the least, which completely covers preventive services, such as regular checkup, cleaning and X-ray. Option 3 costs the most, which completely covers preventive services and simple treatments such as fillings, deep cleaning, simple extractions. Option 3 also covers about 50% of more complicated procedures, such as crowns and dentures. Option 2, offering less coverage than option 3. 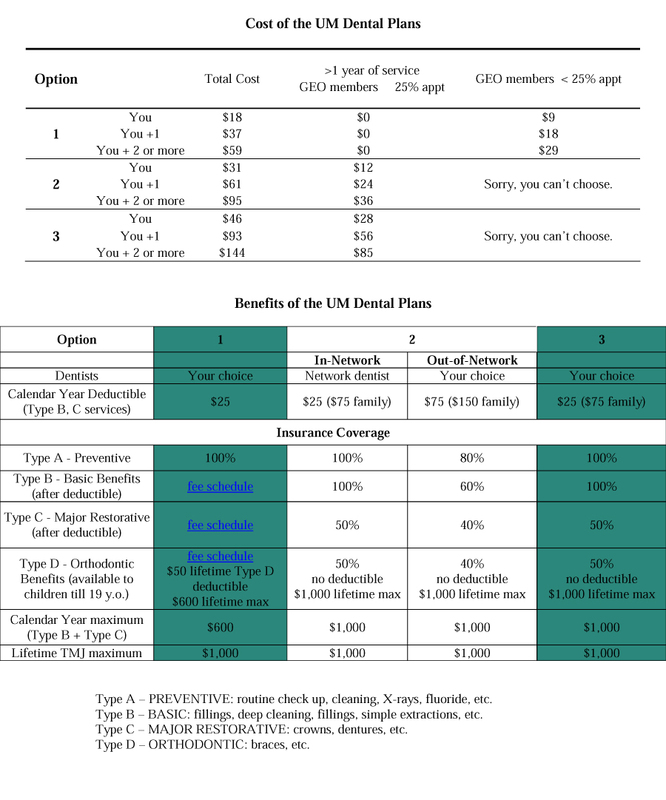 It partially covers all types of services, but you can get benefits equivalent to option 3 if you choose a network dentist like us. Enrollment is usually open in October or in the beginning of your appointment. Depending on your appointment, UM makes some contribution to your plan. Check with your department or the benefits office. We are creating this section to answer your questions. You are very welcome to contact usfor any questions you have.